Welcome to Shred Wise Inc., the locally based paper shredding company that is dedicated to businesses and individuals in Lake Forest, Rancho Santa Margarita, and other Orange County cities. Since 2006, we have provided our diverse range of customers with safe, secure, and reliable document destruction services at highly cost-effective rates. With the use of state-of-the-art mobile shred trucks, our experienced team is able to shred your sensitive documents, at your site or ours, in accordance with current privacy legislation and on a schedule that fits your specific needs. Shred Wise is proud to be NAID (National Association for Information Destruction) compliant. NAID is the world’s preeminent trade association for companies that provide information destruction services. By being a member, we stay up to date with the industry’s leading practices for paper shredding as well as data protection regulations. we know how to keep our shredding trucks, support equipment, and shredding protocols in line with the requirements outlined by Gramm-Leach-Bliley, FACTA, HIPAA, and other privacy laws. At Shred Wise, our commitment to the satisfaction of our customers is unparalleled. We are one of the few shredding companies serving Lake Forest and Rancho Santa Margarita to offer effective mobile shredding with extremely flexible service. Our clients can choose to have us visit them on an as-needed basis or set up regularly scheduled visits without long term contracts. In every scenario, our clients don’t have to worry about hidden fees, surcharges for every additional service, or contracts that are hard to get out of. Our off-site and on-site paper shredding services are available to both residential and commercial clients in Lake Forest & Rancho Santa Margarita. We provide our mobile shredding services between Monday through Friday. We also welcome drop offs at our facility, which is located at 3222 E. Chapman Ave., Orange, California 92869, between 7am and 5:30pm Monday through Saturday, and 8am to 12pm on Sundays. Call us today at (714) 282-7771. 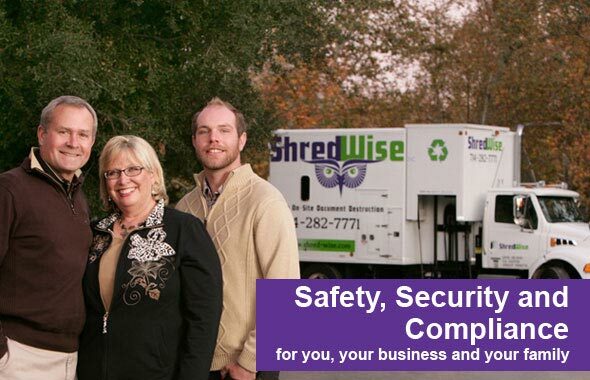 Shred Wise Inc. is a family owned and operated mobile shredding company that has been serving Lake Forest & Rancho Santa Margarita businesses and residents for nearly a decade. Our primary goal is to always give our valued clients excellent service at a great price. For us, this translates to providing our clients with secure, reliable, and convenient paper shredding with superior customer service. Shred Wise is NAID-compliant, and fully licensed, bonded, and insured. 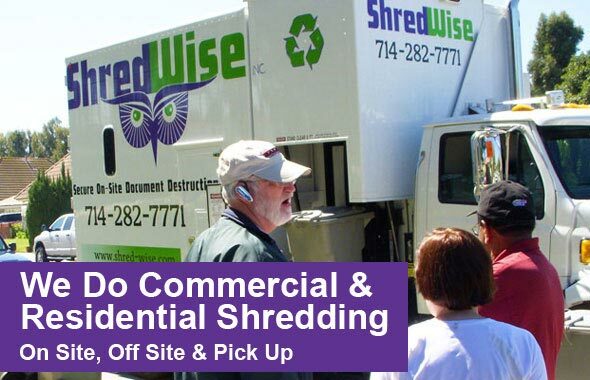 Since 2006, Shred Wise has provided thousands of clients across Orange County with reliable and cost-effective shredding services. Our customizable mobile shredding service enables us to serve both residential and commercial shredding needs, whether they need a one-time clean out or ongoing weekly, biweekly, monthly,bimonthly, or quarterly shredding. We use shred trucks that can effectively shred 6,000 pounds of paper each hour. In most cases, we can drive our shred truck on any residential or commercial street with adequate clearance and complete all of the shredding while you watch. Rancho Santa Margarita & Lake Forest clients can choose to witness the document destruction process curbside or on our onboard shred cam which lets you see inside the truck’s shredding area. While on-site mobile shredding is highly efficient, we never compromise our security protocols for the sake of speed. Call today to learn more. We can provide you with an over-the-phone estimate and always provide certificates of destruction at the completion of each shred assignment. Shred Wise shreds documents at our facility in Orange for Rancho Santa Margarita residential and commercial clients seven days a week. We welcome drop offs throughout the day or can even arrange pickups for customers who have a significant amount of paper to shred, such as multiple bins or pallets. When off-site shredding is requested, we’ll dispatch a panel truck to pick up your paper and load it onto our truck. The truck is then locked and driven back to our facility. At our facility, your sensitive documents will be thoroughly shredded and then transported to a trusted recycling center. As is always the case, our clients are always welcome to witness the shredding process in person and then given a Certificate of Destruction for their records. Our ongoing shredding services are ideal for offices of all sizes in Lake Forest. Ongoing shredding services are typically scheduled on a weekly, biweekly, monthly, or bimonthly basis based on a simple service agreement. These agreements are essentially month to month and feature simple, straight-forward language, which means no hidden fees and no long-term commitment. They also set up the frequency of our visits, guarantee our rates for one year, and state that you can use our secure shred containers at no additional cost for the duration of our services. 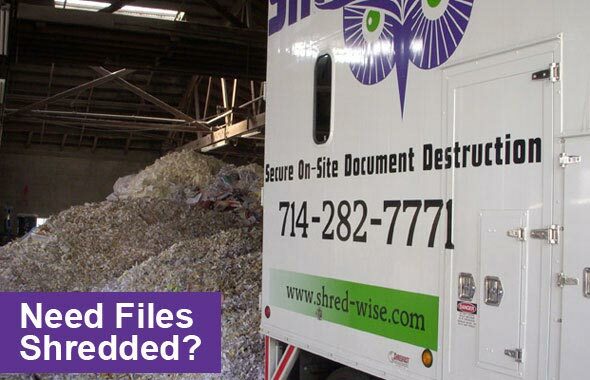 When it becomes time for our clients in Lake Forest & Rancho Santa Margarita to purge a large amount of sensitive information from their offices or archives, we will either send out a mobile shred truck for a one-time, on-site purge or a panel truck for a one-time, off-site purge. This service follows our strict document destruction protocols and ensures that your confidential documents are kept secure from start to finish. As with our on-site shredding service, we use our mobile shred trucks, which are capable of shredding 6,000 pounds of paper per minute, to shred your paper and then transport a mixture of all the paper we shred to one of our preferred recycling centers. Your shredded paper will be 100% recycled, and we will issue you a Certificate of Destruction once the process is complete. Our mobile shredding prices are usually less expensive than taking them to a drop-off shred location yourself. Additionally, if you have more than ten filled bins, you may qualify for volume discounts on our mobile shredding services. If you would like a quote over the phone for paper shredding services in Lake Forest & Rancho Santa Margarita, we are happy to do that. You can also take a photo with your cell phone and that will give us an idea of how much paper you need shredded. Call today to learn more or to schedule on-site or off-site shredding in Lake Forest & Rancho Santa Margarita. Because we are based in Orange and keep nearly all of our service routes in Orange County, we can usually accommodate same-day and next-day requests for on-site shredding. Mobile shredding is available Monday through Friday, but drop-off service is available seven days a week.